It is 1:30 in the afternoon on Mardi Gras day some time in the early 1890s. One can make out at least two dozen horsecars stopped on Canal Street while the parade passes. 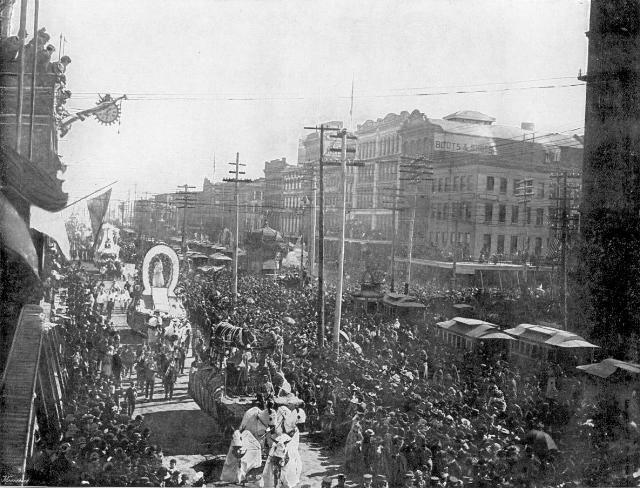 The ornate floats are typical of Mardi Gras, even today. The members of the krewe and even their horses are costumed and masked. We are looking outward, away from the river. The ornate fountain at the Camp/Chartres intersection is prominent just left of center. The nearest horsecars are operated by the New Orleans City Railroad on the French Market and the Levee & Barracks lines. All of the horsecars in sight seem to have the older form of clerestory roof called the Bombay roof.